Greetings, fellow men’s underwear enthusiasts. As a personal friend of Uman, I, AndyUndy have been given the opportunity to serve as a guest critic for Men’s Underwear Blog, and generate some healthy difference of opinion. 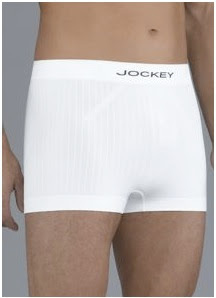 My latest acquired pair of skivvies is a trunk style from Jockey. I must commend the company on this since they have come a long way from the white-bread-briefs of our parents’ generation. These trunks/boxerbriefs (The fine line between the two in this case is compounded further by the length of your thighs and how you wear them) are on the whole quite good. The most outstanding quality is the fabric blend: 86% polyamide / 12% spandex / 2% polypropylene. This may not mean much unless you’re a textiles engineer, but let me tell you it feels wonderful. The material has a great substance; it’s soft, breathable, and oh-so-stretchy! It is sure to retain its shape for years. The waistband and leg bands are incorporated into the material of the underwear. They are not merely elements sewn together. In addition, there are no side seams whatsoever. Therefore, the construction is practically flawless. The fit by contrast is a bit surprising. These trunks have a strong tendency to rise up. (This is what I alluded above) Even the image on the product tag shows the waistline totally smothered. This fit is a bit dated given that “low rise” is all the rave these days. The leg bands have the same problem of not staying put. There is also no allowance made for one’s “naughty bits.” Many trunks have something of a pouch but these do not, and with all that polymer fabric, there isn’t going to be any give in the near future. I suppose the flip side to this is more support but that quality just isn’t working out in this case. At the Jockey store this trunk came in two flavors; Indigo and fire engine red. The waistband and leg bands are adorned with an analogous tricolor stripe; a very nice touch. 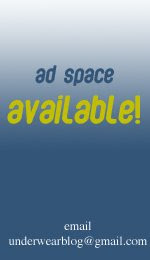 (Unfortunately I have not seen this feature on the website.) What is available online is just as nice though. The price is comparable to many of the more exclusive names on the market, which may or may not be justified. Personally I would not buy them at the suggested retail price. In closing I would like to say that the trunk’s strengths exceed its shortcomings. If you are very ..err… closely attached to trunks, these are a great fit for you. I would agree with you about the waistband and the leg bands. I have a pair on right now and the waist band has been crumpled over all day the the legs up near my groin. The best pair of Jockey's I have with legs are the ones that come down mid way on the thigh and have a pouch. All stays where it should with comfort. It's nice that someone else has experienced this problem as well. They really need better elastic or some change in fabric that doesnt slide so easily on the skin.